Barbara A. 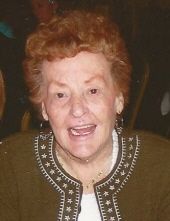 (Dempsey,O'Donnell ) Walker – Age 90, beloved wife of the late James F. O’Donnell and John H. Walker died Saturday morning peacefully at her home surrounded by her loving family. She was born in Malden, January 26, 1929, a daughter of the late Stanley R. and Gladys K. (Butler) Dempsey and lived in Billerica her entire life. Barbara was the first child of nine to Gladys and Stanley Dempsey. She was a warm-hearted loving daughter", BIG SIS" to all her siblings. Barbara’s strength and love for family was passed on to her three children Jim, Heidi and Barbie. She taught them to be strong, loving and compassionate people. To never give up which they passed on to their children. She worked very hard to provide her children with a college education, which was very important to her. Her greatest joys were spending time with her family and her time spent at her home on Plum Island, and traveling with her husband John. Barbara was employed as an Operator for New England Telephone and later worked as a Secretary for the Billerica School Department having worked at the Talbot and Vining Elementary Schools and retired from the Billerica Memorial High School in 1991. She is survived by her son, James F. O’Donnell Jr. and his wife Brenda of Billerica; her daughters, Heidi Lane and her husband Walter of Chelmsford and Barbara Cooke and her husband Charles of Billerica; her grandchildren Matthew Dempsey Cooke and his fiance Paula DeCosta of Medford, Adam O'Donnell of Billerica and her beloved Patrick John Lane who she is with now; her siblings, Nancy Dagle of Billerica, Richard Dempsey of AZ, Jack Dempsey of Hyannis, Pauline Mahoney and Donald Dempsey of Newbury and Jane Kennedy of Billerica and , and sister of the late Stanley Dempsey Jr. and Patricia Fermoyle and loving brother in laws Gerry Mahoney, Mikey Fermoyle, Mickey Kennedy, and Al Dagle. Her family would like to express their gratitude for the exceptional care given by the Leahy Hospice nurses and her home health aid providers. Billerica from 10-12 Noon. A graveside service will be held at the Fox Hill Cemetery , 130 Andover Rd. at 12:30 p.m. Relatives and friends respectfully invited. Memorial contributions may be made to the Make a Wish Foundation, One Bullfinch Place, Boston, MA 02114. "Email Address" would like to share the life celebration of Barbara A. Walker. Click on the "link" to go to share a favorite memory or leave a condolence message for the family.